In our experience, a good portion of the traditional printing industry views the internet and related technologies as a back breaker to their businesses. The on-set of the “internet age” and “digital marketing” certainly has hit the industry hard, but in order to survive and thrive going forward, the concept of “Print that Performs” is one that should be embraced, as it encourages a more symbiotic, as opposed to adversarial, relationship between print and new technology. 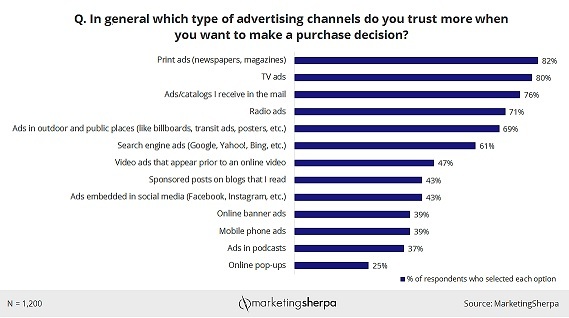 As shown in the handy chart above (Courtesy of www.MarketingSherpa.com), printed ads in newspapers and magazines are still the most trusted form of advertising when it comes down to making a consumer purchasing decision. In the upper half of the chart you will also notice that traditional style printed mailings of ads & catalogs and printed ads in public places such as posters & flyers also rank highly. From the middle of the list, down towards the bottom of the list is the majority of digital advertising methods such as online banner ads, popup ads, social media ads, and sponsored blog posts. The sheer size and unlimited nature of the internet tends to de-value digital advertising. Just about anyone can post just about anything they would like, whether legitimate or fraudulent, and it is often hard to differentiate whether an ad is real or fake. How many of us get overwhelmed with what we interpret as “Spam” in our email and social media accounts? Buried among all that “Spam” is probably some legitimate advertising, but in my experience, not many people are taking the time to sort the good from the bad. Traditional advertising methods tend to lend some credibility to the messenger. If you see the ad in your favorite magazine or newspaper, you are more likely to have a favorable view of that particular brand or product. There is a limited amount of space in these types of vessels, and you often must pay top dollar for your ad space. These things all factor in to a more legitimate, trusted feeling about printed ads. Printing and digital advertising can co-exist successfully and should really complement each other, if we start thinking along these lines. Print should still be a big part of any company's marketing strategy, taking advantage of the built-in trust factor that print has over digital methods. So, whether interactive printed ads, innovative features as a part of ad designs, unique and eye-catching packaging, or the return to popularity of catalogs generating sales online, examples of advancements in traditional print mixed with some technology are everywhere, and as highlighted in the quote above, we all are looking for a sustainable future in our businesses. Here’s to ongoing growth in our industry! Click Here for the full interview from Post Press Magazine’s Website.